This waterfall in Hawkins county, Tennessee is located next to a road. It's a pretty nice waterfall that is partially trashed up by locals making it a party and dump spot. The water volume is low so it only gets a 3.0 on the WOW factor, while the height and location bump it up to a five on my overall rating scale. 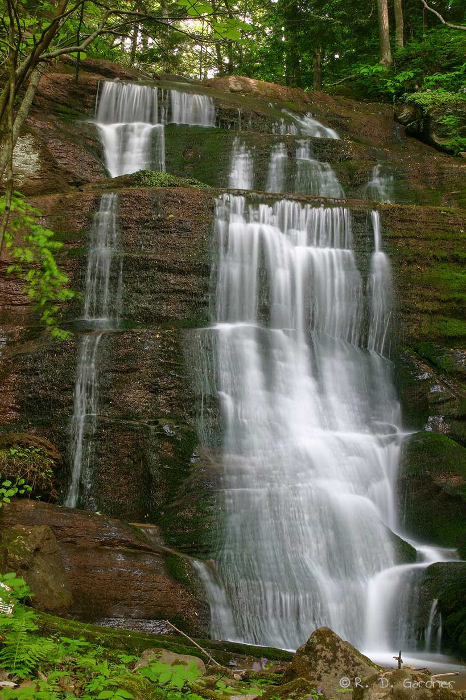 Located just outside of Church Hill, TN on the edge of Bays Mountain (its namesake of course), there are also two nearby falls in Laurel Run Park. 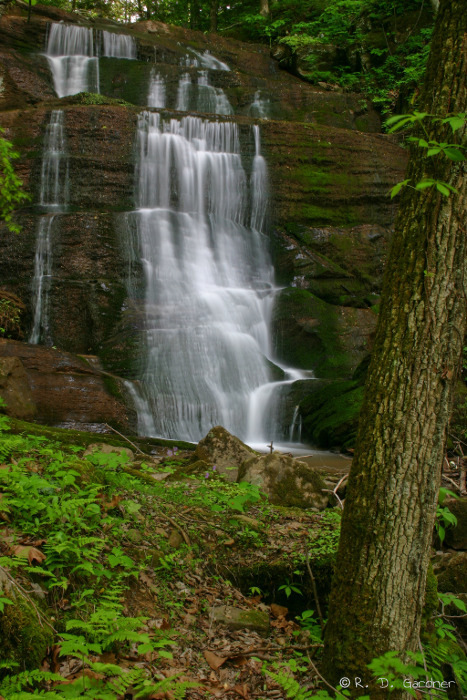 Laurel Run Park is a great place to spend an afternoon with the family and a hiking trail to both Laurel Run Falls and Kiner Creek Falls can be accessed there. Leaving Laurel Run Park (directions to Laurel Run Park) on the entrance road, turn left (south) at the first intersection about 1/4 mile out of the park. Roads aren't always marked well but I think you're turning onto Mountain Rd. After another short distance you will reach another 3-way intersection with Blair Gap Rd to the left and Mountain Rd continuing to the right. At this point Bays Mountain Falls is located directly in front of you. You can either drive up Blair Gap Rd about 600 feet or so to the top of the falls or you can park and ask permission from the land owner to walk through their yard to the base of the falls. I recommend the latter as the top of the falls is the main party hangout and not in good shape. Naturally the pictures are only good at the base as well. Driving from Church Hill, just follow the directions to Laurel Run Park and turn on Mountain Rd to the right just before getting to the park. You can always backtrack. Use the following link to customize your own directions to Bays Mountain Falls. It was mid-to-late afternoon on my visit and the lighting conditions were fair. The wind was pretty still which helped. You could have good conditions most of the day at this waterfall as it is well protected by trees. Nevertheless, the standard rules of shooting early or late still prevail. There was an old rusty barrel near the base of the falls that prevented good pictures from most angles except the ones shown above. Unless you visit this waterfall after a major rain event you will want to use a slow shutter speed so plan on bringing a tripod. A normal-to-wide angle lens will work fine. I promise to use it only to send you Waterfall Photo Digest.